I couldn’t pick a favourite. Anyone who reads this blog will know that I have a slight obsession with chocolate. And cake. While I have a couple of fall-back favourites up my sleeve (see Little Black Dress Chocolate Cake and Simple Chocolate Birthday Cake), I’m always on the lookout for new and delicious ways to indulge in my favourite ingredient. Which is why I just had to try this incredible flourless chocolate mousse cake. Taken from the Ottolenghi cookbook, it essentially promises two cakes in one; the bottom layer cooked longer for a firm, cakey texture, while the top layer remains lighter and more mousse-like. A couple of weeks ago a lovely lady from Rachel’s Organics got in touch to see if I’d like to review some of their products. I’m never quite sure what I think about blogging and freebies, but as I’m already a big fan of the brand (and often use their beautifully creamy butter to bake with), I didn’t think it could do any harm to accept. Perhaps I’d subconsciously been hoping the delivery would keep me in baking ingredients for the foreseeable future, but when a box of different flavoured yoghurts arrived, I was slightly disappointed. I think I’d been hoping to receive some more basic ingredients that I could bake with; milk, butter, cream or even plain yoghurt. Nevertheless, I popped my loot in the fridge, and, with butter on the brain, set about making the cake below. Speaking of butter, this recipe contains a lot of it. And a chocolate. You melt them into a boiling sugar syrup then whip the resulting glossy mixture together with fluffy egg white to create a flourless delight which should satisfy the most ardent of chocoholics. The cake is then baked in two stages, meaning the base is firm, dense and fudgey, while the top layer is smoother and more silky, with an almost souffle-like texture. This is a serious stuff – rich, indulgent and utterly delicious. Normally I’d serve this kind of dessert with a dollop of whipped cream, cut through with a little booze and golden caster sugar for extra flavour, but with the fridge groaning with yoghurt, it seemed a bit crazy to buy in any more dairy. Instead I served wedges of cake in a thick puddle of Rachel’s Organic Honey Greek Yoghurt and, despite my reservations about pre-made flavours, it was great. The yoghurt is smooth and creamy, with all the flavour I’d expect from Rachel’s lovely butter. Greek yoghurt is mixed with a little cream for a slightly more indulgent finish (we’re not talking low-fat yoghurt as health food here, but look at the cake you’re eating it with), and the Himalayan honey flavour is intensely rich, if a little sweet. These are the only three ingredients, all certified organic and lovingly packaged in recyclable pots. Rachel’s Organics is Britain’s first ever certified organic dairy, producing great products with lots of passion, and as such, I think they deserve a bit of a big up. Am I a sell out? Do you think bloggers should review in return for freebies? 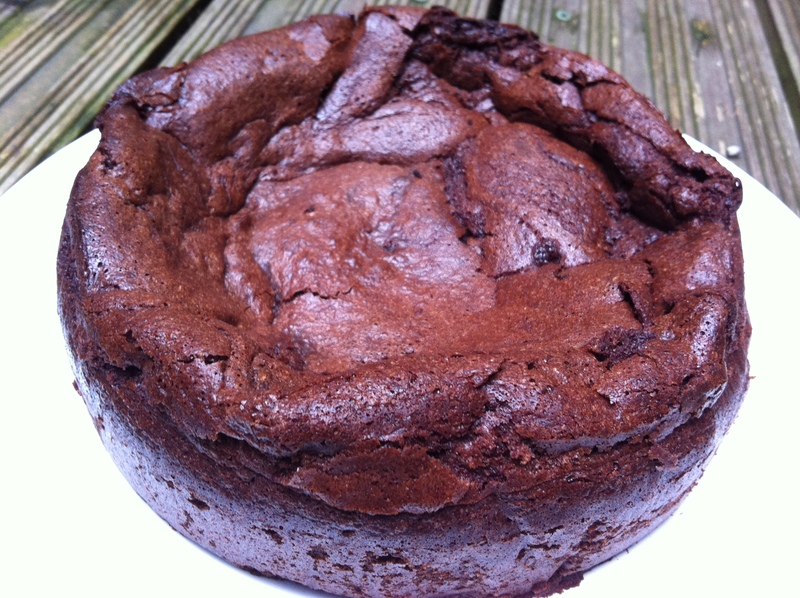 And most importantly, do you have a favourite chocolate cake recipe I should know about? Preheat the oven to 170 degrees C. Grease and line a 20cm springform cake tin. Place the butter and chocolate in a large, heatproof bowl. Mix the sugar and water in a saucepan and bring to the boil over a medium heat. Pour the boiling sugar syrup over the butter and chocolate and stir until melted into a runny chocolate sauce. Leave to cool slightly then stir the egg yolks in, one at a time. Put the egg whites in a large bowl with the salt and whisk until just forming stiff peaks. Using a metal spoon, gently fold the egg white into the chocolate mixture one third at a time, taking care not to knock out too much air. Pour 800g (approx. 2/3 of the mixture) into the prepared tin and bake for around 30-40 mins until a skewer inserted in the centre comes out almost completely clean. Remove from the oven, leave to cool slightly, then top with the remaining batter and cook for another 15-20 mins. It’s done when a skewer inserted in the middle brings up moist crumbs, but not a liquid batter. Leave to cool completely before removing from the tin. Serve the fudgey wedges of cake straight up with a dusting of cocoa powder, or accompanied by a dollop of sharp Greek yoghurt. Looks good! I tried this recipe a while back and it didn’t really work for me (though I think I did something silly to it, can’t remember now). I’ve only accepted one free thing for review – a cookbook. I made a couple of the recipes and spent ages reading it, checking mistakes etc before finals meant I didn’t have any time to post it. In the meantime I realised I wasn’t comfortable posting it – against my expectations I wasn’t impressed by the book and the whole thing felt a bit odd and forced. So now I don’t accept anything. But I don’t think it’s wrong – it’s just one of those choices you have to make for your blog! 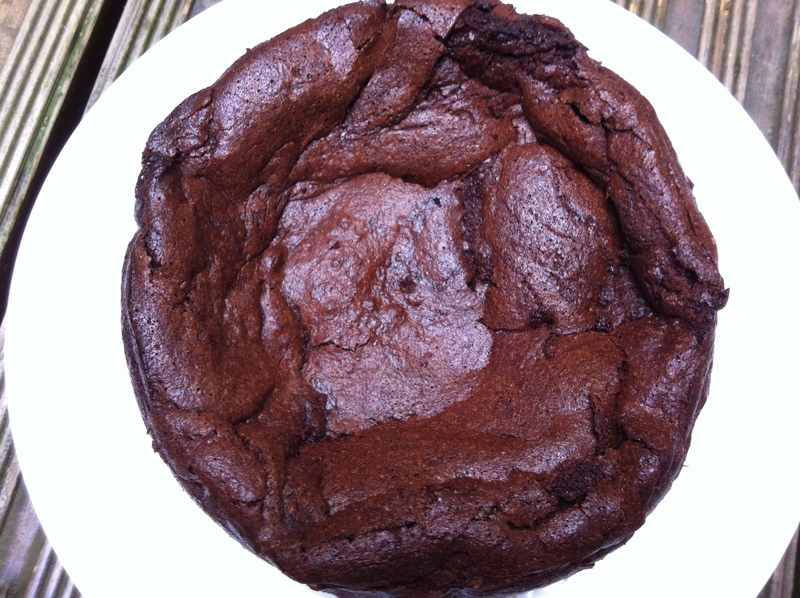 Poires au Chocolat – I made some Ottolenghi brownies a while ago which turned out a complete disaster as it didn’t recommend allowing the chocolate to cool slightly before adding the eggs. Everything split and it was horrid. Either that or over-whisking the egg whites I’d guess. And yep, I’d only ever review something I thought was really good/worth it. Frugal Feeding – it’s definitely decadent! I think reviewing products definitely depends on what they are, and if you actually like them/would want to promote them. If I didn’t like them, I’d rather not post rather than putting up a rubbish review! I agree actually. There’s no point doing a rubbish review unless you’re a critic or an actual customer and want to warn about something, especially since things like this are objective. Have you tried Yeo Valley passion fruit probiotic yoghurt? It’s so good! It’s a limited edition one in Asda (not sure why it only seems to be there) but I shop in asda just so I can get it! Choc cake looks good. If you plug Rachel’s I’m gonna plug Gail’s! 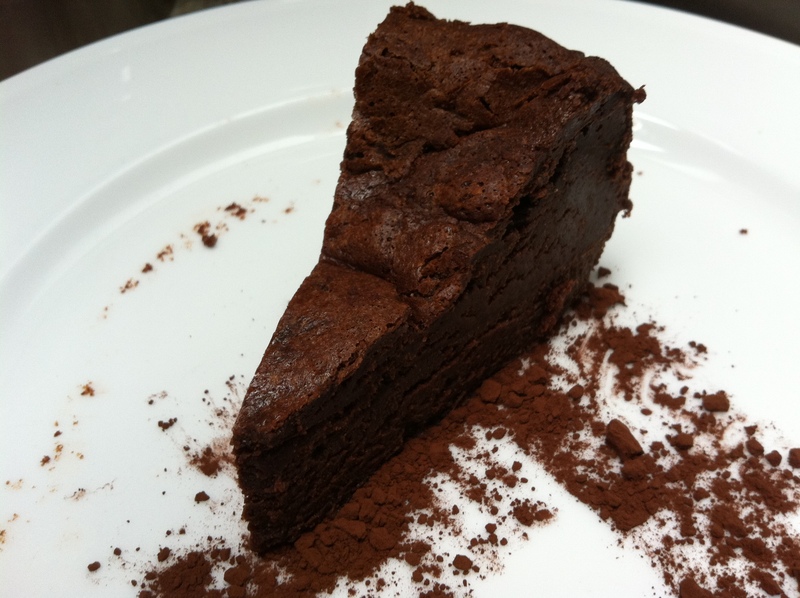 We’ve just started doing a flourless choccie mousse cake that’s v similar to this. Give it a try to compare. I’m not normally a fan of flavoured yoghurts, preferring to add my own fruit, honet etc but I do like Yeo Valley – they also make gorgeous milk and butter! Thanks Mel 🙂 It’s so yummy – and if you can’t be bothered to bake it in two stages, it’s still delicious cooked as one cake, you just don’t get the texture contrast. Hmm I totally agree that it is impossible to chose just one favourite type of chocolate cake. I could never choose between my Kladdaka and my version of a flourless chocolate cake. As for the blogging and reviewing situation I wouldnt know as Ive never been asked (whaaa). Im not sure what I would do unless someone is offering me a free kitchen aid in which I would definitely take it (yoink). Thanks for such a lovely comment! You won’t be disappointed with the cake 🙂 Try Hugh’s Little Black Dress chocolate cake on my site too – there’s a tiny bit of flour, but you could substitute it with ground almonds and it’s deelish! Oh my goodness does this look amazing! Loving the gluten free recipe – more please! (preferably easy, impossible-to-fail ones that can be made during a small child’s nap…). 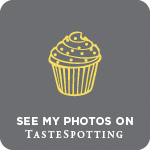 I read this gorgeous gluten-free blog – Canelle et Vanille – there are so many recipes I want to try and they’re all gluten-free, watch this space! I have the book, and this recipe bookmarked! MUST bake this soon…you have me inspired! WOW!! This looks like a great recipe. I’ve made something similar that I liked but baking it in two stages seems like a wonderful switch and I’m definitely going to try this one! Vindee – I had it bookmarked for ages, definitely worth actually getting round to! Simply cooking – baking in stages does give it the edge with that lovely contrast of textures, but I think it would be almost as good baked in one go. You can’t really wrong with chocolate, butter and eggs! Ottolenghi is currently my baking guru – he can do no wrong! Thank you 🙂 And thanks for the Nigella tip…all her chocolate recipes are gorgeous, and the Mousse Cake is no exception!